Organic semiconductors offer new vistas for the exploration of electronics and optoelectronics that augments, not necessarily replaces, existing inorganic semiconductors. The cost of inorganic semiconductors is quite prohibitive for large area applications, nearing the price per square inch of real estate in Manhattan. Also, the rigidity and opacity of inorganic semiconductors prevent them from specialized applications that require flexibility and transparency (i.e. heads-up display). Polymer semiconductors and organic small molecule semiconductors are two classes of materials that enable new opportunities. Small molecules are generally sublimed in a vacuum system, whereas polymers are dissolved in appropriate solvents and applied by solution processing, such as spin-coating, ink-jet printing and screen printing. Applications for polymer semiconductors include polymer field effect transistors (PFET), polymer light emitting diodes (PLED) and polymer solar cells. Our group is exploring PFETs for large area flexible electronics, such as Smartcard technology (i.e. bankcards), where the computational power and memory storage needed is very simple and does not warrant a Si CMOS solution. Our group has explored short channel effects of polythiophene-based PFETs and the photo-responsivity of other PFETs that show a dramatic response to PFET operation and drain current with incident light. The photoFET was performed as a joint effort with Prof. Uwe H.F. Bunz at Georgia Tech. Also, our group is investigating pulsed plasma polymerized (PPP) dielectrics deposited by our collaboration with Prof. Richard B. Timmons at the University of Texas at Arlington. These dielectric films are intended for use as flexible gate dielectric material in PFETs that replaces rigid silicon dioxide, typically employed in PFETs that sacrifices the flexibility advantage of PFETs over inorganic semiconductors. The pulsed plasma process also offers a very gentle deposition that occurs during the OFF cycle. A large parameter space can be explored of deposition conditions, post-deposition heat treatments and selection of a wide range of monomer source materials. By a judicious choice of monomers, both high dielectric constant (for gate oxide replacements) and low dielectric constant (for interlayer dielectrics) are envisioned. In 1999, Prof. Berger took a sabbatical leave while working first at the Max-Planck Institute for Polymer Research, Mainz, Germany while supported by Prof. Dr. Gerhard Wegner and then moved on to Cambridge Display Technology, Ltd., Cambridge, United Kingdom working under Dr. Jeremy Burroughes. Graduate Student, W-J. Yoon, received a Runner-Up in the Best Poster Award at the 34th IEEE Photovoltaic Specialists Conference, Philadelphia, PA (June 7-12, 2009). "Conference Chairman, " Ohio State Polymer Consortium Review," in Columbus, OH (April 27, 2004). "Next generation plastic low cost memory devices," Paul R. Berger, Nanoelectronics: Near Term Commercial Applications for Nanotechnology in Electronics, San Jose, California, (November 8-10, 2006). One pending application to be filed by Cambridge Display Technology on light emitting polymers during consulting services. (July 17, 1999). "Covering," filed by Cambridge Display Technology Limited in Great Britain (App. No. GB9928694.0), Filed December 3, 1999. "Fibre Optic Device," ," Alec Gunner, Karl Stephen Heeks, Peter Devine, Julian Charles Carter, George Bead, Richard O'Dell, Ian Millard and Paul Berger, filed by Cambridge Display Technology Limited in Great Britain (App. No. GB9927594.3), Filed November 22, 1999. Granted May 23, 2001, GB2356464. U. S. Patent # 6,878,297, Issued on April 12, 2005. Great Britain patent pending (App. No. GB9901334.4), Filed January 21, 1999, Priority Claimed December 8, 1998; "Display Devic es," filed by Cambridge Display Technology Limited in Great Britain, App. No. GB9827014.3). "Patterned Organic Light-Emitting Device," filed by Cambridge Display Technology Limited in Great Britain (App. No. GB9618476.7), Filed September 4, 1996. "Electrode Surface Modifications for Efficient Polymer Bulk Heterojunction Photovoltaic Devices," Paul R. Berger, 2010 SEMICON, to be presented at Symposium on Emerging Semiconductor Technologies at ISTC/CSTIC, Shanghai, China, (March 16-18, 2010). "Efficient Poly(3-hexylthiophene)-Fullerene Derivative Bulk Heterojunction Photovoltaic Devices using Unique Self-assembled Layer of Ag Nanoparticles with Controllable Particle-to-particle Spacing," Woo-Jun Yoon, Kyung-Young Jung, Fernando L. Teixeira, Paul R. Berger, Jiwen Liu, Thirumalai Duraisamy, Rao Revur and Suvankar Sengupta, 34th IEEE Photovoltaic Specialists Conference, Philadelphia, PA (June 7-12, 2009). "Efficient Organic Bulk Heterojunction Solar Cells through Near Infrared Absorbing Metallated Thiophene Complexes," Woo-Jun Yoon, Yagnaseni Ghosh, Brian Alberding, Malcolm H. Chisholm and Paul R. Berger, 34th IEEE Photovoltaic Specialists Conference, Philadelphia, PA (June 7-12, 2009). Runner-up Best Poster Award. "4.8% Efficient Poly(3-hexylthiophene)-Fullerene Derivative (1:0.8) Bulk Heterojunction Photovoltaic Devices using surface modifications to the indium tin oxide (ITO) anodes through plasma oxidized silver," Woo-Jun Yoon and Paul R. Berger, 33rd IEEE Photovoltaic Specialists Conference, San Diego, CA (May 11-16, 2008). Honorable Mention Award. "Polymer-Fullerene Bulk Heterojunction Photovoltaic Devices for Efficient Solar Energy Conversion on a Low-Cost, Flexible Substrate," Woo-Jun Yoon and Paul R. Berger, University Clean Energy Alliance of Ohio (UCEAO) Workshop, April 24, 2008. "Enhanced Light Emission using Thin Metal-Halide Cathodic Interlayers for Improved Electron Injection into MEH-PPV Polymer Light Emitting Diodes," Woo-Jun Yoon, Scott B. Orlove, Robert L. Olmon, and Paul R. Berger, Fall 2005 MRS Meeting, Symposium I: Interfaces in Organic & Molecular Electronics II in Boston, MA (November 28 - December 2, 2005). "High-K Polymerized Dichlorotetramethyldisiloxane Films Deposited by Radio Frequency Pulsed Plasma for Gate Dielectrics in Flexible Polymer FETs," Yifan Xu, Paul R. Berger, Jai Cho and Richard B. Timmons, Spring 2005 MRS Meeting, Symposium I: Organic Thin-Film Electronics in San Francisco, CA (March 28 - April 1, 2005). 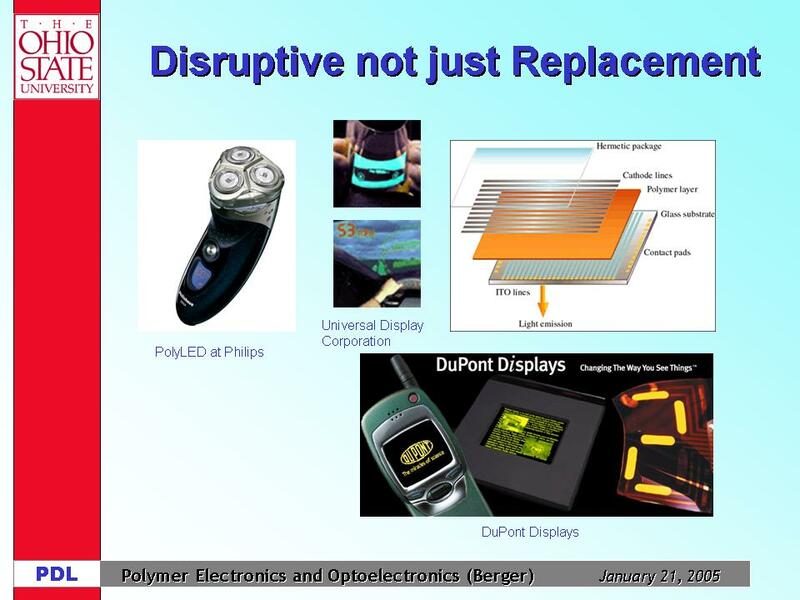 "Light Sensitive Polymer Thin Film Transistors Based on BAS-PPE," Yifan Xu, Paul R. Berger, James N. Wilson and Uwe H.F. Bunz, Spring 2003 MRS Meeting, Symposium I: Flexible Electronics - Materials and Device Technology in San Francisco, CA (April 12-16, 2004). "C-V Characterization of Pulsed Plasma Polymerized Allylamine Dielectrics," Yifan Xu, Paul R. Berger, Jai Cho and Richard B. Timmons, Fall MRS Meeting in Boston, MA (December 2-6, 2002). Last updated March 2, 2014.